Traditional braces are the regular braces that people have worn for years. Not much has changed in the metal appearance other than being slightly smaller, but the science and physics behind them has. Nowadays, we use “light forces”. What this means to you as a patient considering braces, is less pain! Bands and brackets are placed on your teeth, and you get to choose your “colors”, including clear and silver for those not wanting to show off your style through orthodontic treatment! Clear braces are just like the regular braces, but cosmetic in nature. They are made of a porcelain/ceramic substrate and they go on your teeth just like the traditional brackets do. They work just as well, but can break a little easier, so choose wisely based on your lifestyle! 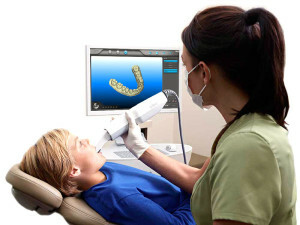 Invisalign, the true “clear braces” are not braces at all, but a series of trays you wear over time to align your teeth. This is meant for the patients who fall into the category of being an Invisalign candidate, but also will be responsible with wearing them. They work extremely well, and are made from a 3d laser scanner that we take in the office and send to Invisalign to have your trays manufactured for you. There are several different phases of treatment that are options, so let our fully certified doctors guide you through the right orthodontic treatment. With most children, we begin with what we call an “orthodontic recall”, which is given to our patients on a set schedule to allow you to follow through with any issues or instances that may arise. This is known as pre-treatment recall. Alternatively, should your child require early treatment, we call that Phase 1, or “early interceptive orthodontics”. This helps stabilize and stop early developmental problems that may arise from spacing or crowding issues, as well as habits, such as sucking a thumb or pacifier earlier in life. Also, headgear and expanders are a useful tool earlier in life while the bones are easier to work with during early growth phases. Then, of course, we have adolescent and adult treatment, both of which can be done in any of the three options above (metal, ceramic/porcelain, and Invisalign). We have an iTero digital scanner in our office. This allows us to take your impressions digitally with a scanner using laser technology. It is extremely accurate and in most cases, can show you what your teeth will look like once completed with treatment down the road. It is a great tool for the visual patients, and it helps see your digital models immediately to decide what treatment will be best. Teamed with an all digital panoramic xray and digital cephalmetric technology and photographs, our office is light years ahead! We offer in-office financing and accept most PPO insurances, as well as other financing options. Our consultations are done in-office, by appointment only, and are complimentary. Call today to make your appointment and get the smile you have always wanted!